This article will have seven reasons why Steve Bullock should be out of public service in Montana. ISNT IT SUCH A SHAME ABOUT BULLOCK? BULLOCK, MT ATTORNEY GENERAL COVERS UP FELONIES, CREATES THEM. I. Steve Bullock as Montana Attorney General used public funds to protect the unauthorized practice, and criminal activity of a Montana Law Student. Steve Bullock's Tort Defense Division under Michael King protected Wetzsteon. The influence of Steve Bullock prompted the Montana Supreme Court to violate its own order that established the Student Practice Rule in 1975. Montana Ethics rule 5.5 prohibits assisting unauthorized practice of ANYONE. The FBI's #1 criminal priority is public fraud--proven with Montana Supreme Court Case # DA-10-0492 as the Attorney General office under Steve Bullock protected Angela Wetzsteon's criminal conduct with our tort defense division of the Montana Attorney Generals office in Helena, MT in 2010. Student Practice rules for law students are followed in 49 other states, but Steve Bullock protected criminal conduct of a UM law student, and paid for defense with public tax dollars. II. Steve Bullock embezzles/hides public funds from lawsuits to benefit "victims" yet fails to benefit victims in Montana. Zyprexa lawsuit in 2007 judgement did not benefit victims, as "Mental Health Trustfund" does not benefit victims who were not mentally ill in Montana. $14M judgement netted only $9M for trust fund. Montana Mental Health goes without doctors, proper care, training, violates confidentiality. Steve Bullock stole $4M for the Montana Department of Justice from the Zyprexa judgment. The Montana Zyprexa court scam: Bullock's trust fund does not benefit victims. Western Montana Mental Health releases confidential health information, retaliates. III. Steve Bullock does not protect Montana victims. Missoula Independent "Above the Law" published Dec. 1, 2011 about crime within law enforcement in Montana as Steve Bullock is Chief Law Enforcement Officer in Montana. Zyprexa victims were elderly, non-mental health patients who suffered medically. Initiative writers (PolyMontana) wrote open letter dis-satisfied with Steve Bullock. Victims of professional misconduct (Consumer protection) not protected; unauthorized practice of Angela Wetzsteon protected by Steve Bullocks Montana Attorney General Office. http://www.montanapoliticalnews.com OR Scroll below for affidavit. Felony evidence tampering in Montana counties. 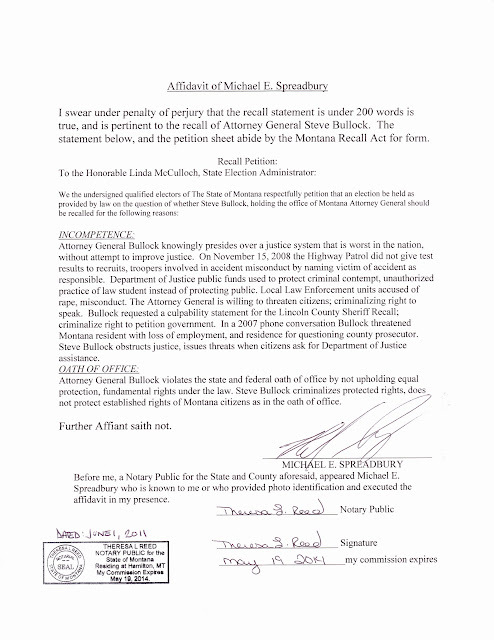 Steve Bullock does not improve the 48/48 status of Montana for Justice/Justice System (see "Recall Bullock" affidavit online or scroll below). Steve Bullock claims "no Jurisdiction" to unlawful law enforcement activity. http://www.montanapoliticalnews.com OR Scroll to bottom of this post. Bullock's AG office claims no jurisdiction in Montana for the 32 sec.Video of Montana Law Enforcement & Probation Officer Misconduct (now in 9 languages, above 2000 views). V. Steve Bullock does not respect Montana law or citizens. The Citizen process for medical Marijuana law from 2004 not respected by Steve Bullock. Steve Bullock does not respect protections, laws through the office of Montana Attorney General in Montana; Montana citizens are arbitrarily protected by Steve Bullock at his choice. A letter to President Obama about Montana Justice System, including Steve Bullock's tactics that did reep criminal charges to the messenger; prosecuted by Steve Bullock (read on every continent). http://www.montanapoliticalnews.com OR scroll below to see sworn affidavit. Prosecute Steve Bullock (& George Corn) for negligent Constitutional violations (deprivations). VI. Steve Bullock gives pretext (false) argument about campaign funding for Montana. Bullock represents a corporate party (Democrat) who accepts large out of state funds, help. Steve Bullock tells of getting corporate money out of politics in Montana, even giving pretext speeches in front of US Congress, although Bullock represents a corporate party. Corporate parties like Steve Bullocks Democrats care only for money and power, will threaten if that power or money is compromised. Steve Bullock did not follow Montana election law, accepted funds from out of state interests. Steve Bullock willing to threaten to maintain power, not willing to check corruption in Montana governments/law enforcement to protect the people. Steve Bullock's pretext argument about corporate money in Montana politics. Steve Bullock wanting to be bigger than just from Montana; pretext about public funding. Unfortunately when you threaten the livelihood of a Federal Officer, you stay in Montana, no matter how many political favors you did or expect. POST ELECTION NOTE: Bullock won Governor race claiming illegal campaign contribuitons of Hill, and used his former boss Mike McGrath in the Supreme Court to win the election. Steve Bullock conveniently was found liable for illegal contributions after he was Governor. VII. Montana needs less corrupt lawyers, and less corruption to obtain prosperity. Justice and jobs means prosperity for Montana. "If you are not part of the solution, you are part of the problem"
We the People Montana T-shirts said "Justice Brings Prosperity"
Montana Supreme Court does not abide by Montana law, or its own orders. Creating Jobs in Montana: at one time on top of search engines. (takes bribes[per Montana Main St. blog circa. 2007]). MT Supra cases determined by bribes of lobbyists. This article does not support a candidate for Governor of Montana, it exposes Steve Bullock, Montana candidate for Governor who will NOT be elected in 2012. [also see www.MontanaPoliticalNews.com for more details]. This sets up federal statutes violations by Steve Bullock. One for threatening a federal officer, two for civil rights violations. 18 USC 372 AND PREVIOUSLY 18 USC 242 for Civil Rights. You dont jail and prosecute someone for speaking in public as FELONY intimidation unless you are Steve Bullock in Montana. Read about Steve Bullock's deputy George Corn who jailed, reaped excessive bail and was Steve Bullock's role model in Montana: www.GeorgeCorn.com [hidden on internet searches]. 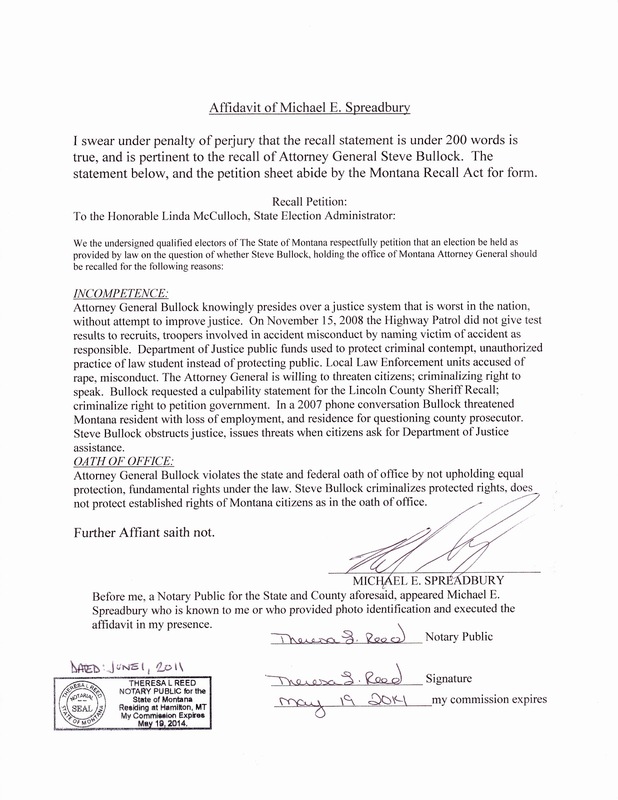 This Affidavit and valid Recall Petition was rejected by the MT Secretary of State Linda McCullugh for Steve Bullock. You get what you dont vote for in Montana; and the coverup and protection is DEEP. Although I did my absolute best, the voters in Montana and the USA are where the govrnments want them: stupid. documenting that Steve Bullock violated the #1 criminal priority of the FBI by using public funds to protect Angela Wetzsteon who carried out his threat to a Federal officer's livelihood August 8, 2007. In that same year, Bullock defrauded the public (same #1 criminal FBI priority)of a judgment for $14M as the victims of the Zyprexa lawsuit were not mentally ill, as Bullock started the "Montana Mental Health Trustfund". Start asking for the Governor's resignation.